This morning there were indeed some bubbles in my starter. And being the Overeager Olivia that I am, I decided to make some less than mediocre sourdough biscuits. The biscuits are another sacrifice to the gods of please save my marriage while I learn to cook Real Food. They were terrible. We're talking rocks. Speaking of marriage, Jacob and I watched Romantics Anonymous last night via the Netflix. It was tres bien, and I recommend it if you feel a hankering for a fun French flick. BUT unless you parle frances, you'll have to read the subtitles and thus you actually have to watch it. You won't be able to fold clothes or crochet or do any other mindless activities during the viewing. 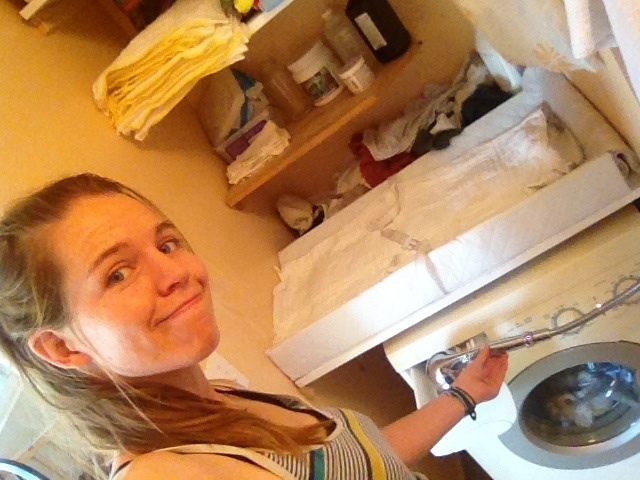 I'm washing diapers right now - which I do two mornings a week - and despite how easy I made it seem. It's actually quite tedious in my apartment size front loading washing machine with WAY low water settings. If I actually want to get the soap out of the diapers, I have to manually add water to each rinse cycle through the soap dispenser. Thankfully in the wonky afterthought backhouse where we live, the washing machine nook is right next to our shower, and the shower head is on a hose. Sometimes I try to balance the shower head on the soap dispenser which always ends with wet bathroom walls. So instead I just stand there forever holding the stupid shower head spraying water into the washing machine. Someday I'm sure when I have more than uno caballerito and I've all but given up on cloth diapering, I will look back on this era and glare at my former self for wasting so much valuable nap time. But the current Kate has managed to feel pretty good about herself, because she knows that it's either diaperwatering or blogsurfing, and I already do too much of the latter. Multilingualism of this post brought to you service of my Tejano upbringing and Wordreference.com. Happy Weekend! And go see The Jen for the rest and the better of the quick takes! I realize it's quite old now, but if you haven't seen Veronica Mars, I would recommend it. Also Friday Night Lights. Awesome even if you don't like sports. I was going to recommend Veronica Mars too; FNL is also pretty good. Warning though, it'll probablyake you miss Texas. More than you already do, of course! Have you watched Downton Abbey yet?? SO awesome!! I had a couple people recommend it, and I finally worked my way through 2 entire seasons when my hubby was one for 10 days for the army. Can't stress how SO awesome it is. consider this a third vote for Veronica Mars. also, Gilmore Girls! You could watch some Wallace and Gromit shorts on Netflix. I watched a few of those, and they're pretty fun. By the way, I made some really delicious lavender/lemon scones this weekend, and oddly enough it made me think of you. You should make scones and enjoy them with your breakfast tea!!!! I just watched Romantics Anonymous- hilarious! I loved it! !